Today is national Dr. Seuss Day, a calendar marking I like to take note of each year. Of course, of his books, the Foot Book is the one I’m most inclined to discuss. Now, for the most part, when your body is sick, you can tell—you’ll get a runny nose, start running a fever, perhaps even vomit. All of these are telling signs that your body is unwell; when you notice one or more of these symptoms, you likely take some medicine, rest a little more, and allow your body to heal. So, how do your feet tell you that they’re sick? By hurting! Foot pain is a strong message from your body that something is wrong with your feet, yet, all too often, people ignore that message in a way they would never do when it comes to colds, fevers or the flu. Ignoring foot pain is a terrible idea—if you see your podiatrist when discomfort first appears, you have a much better shot at correcting a small problem before it becomes an illness. 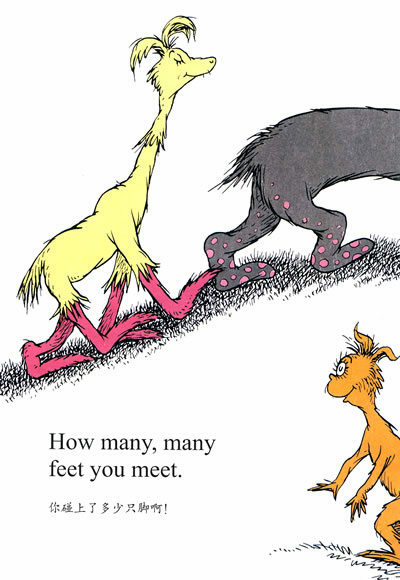 If you don’t believe this Houston podiatrist, take it from the most famous Dr. of them all—Seuss himself. After all, the line that immediately follows “Sick feet” is “up feet”—in other words, when your feet feel off, put them up, get some rest, and schedule an appointment with Dr. Andrew Schneider as soon as possible.